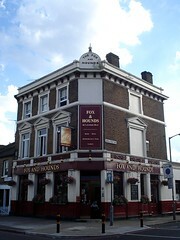 Nice pub with good food and real ale, within walking distance of Clapham Junction Station. It's fairly gastro-like in terms of decor, with a burgundy-painted ceiling, exposed floorboards, wooden tables with most of the varnish scratched off, mismatched wooden chairs, and the obligatory church pew. There are two main rooms, with the one that the bar is in being a bit better-lit. The other room, which is down a few steps, feels slightly more like a restaurant due to the way the tables are arranged, although there's no practical distinction. There's a beer garden out the back. They have three handpumps on the bar. In May 2010, Juliet had an ale from a small brewery, which is always nice, and it was well-kept too. The wine list was comprehensive. In June 2010, the ale options were London Pride, Tintagel Castle Gold (£3.40/pint), and St Austell Proper Job. They're particularly proud of their food (they describe themselves on their website as a 'gastropub'), with a Mediterranean-type menu. As of June 2010, food is served 6.30pm-10pm Mon-Thu; 12.30pm-3pm and 6.30pm-10pm Fri; 12.30pm-4pm and 6.30pm-10pm Sat; and 12.30pm-10pm Sun. Vegetarians are catered for fairly well, depending on how strict a vegetarian you are — many of the "vegetarian" dishes on the June 2010 menu photo contained Parmesan, which according to EU regulation must contain calf rennet in order to be true Parmesan. When Juliet visited in May 2010 the menu included a vegan option — they were happy to confirm that it was vegan, and I got the impression that they'd probably try to fix you up something if need be, although I didn't actually ask. The food was good, and the portion size was generous. Kake and Jo also tried the food, in June 2010. Warm, crusty bread with a dish of olive oil for dipping photo arrived swiftly after we placed our order (there was no charge made for this — we'd already paid for our meal at the bar). Caponata with pesto and mozzarella (£7) photo was pretty good, if quite rich — a good, balanced flavour, though, and all the components on the plate worked together nicely. Agnolotti (£10 for a main course portion) photo was similarly rich. Pork terrine with cornichons and plum chutney (£6.50) photo consisted of large chunks of decent enough pork, barely held together enough to allow slicing — this is not a complaint, merely a note on the style. It went really well with the caponata. They're dog-friendly, and there were a couple of other dogs there when Juliet and Sidney visited (May 2010). No water bowl offered, but it wasn't a hot day, and I didn't ask. Accessibility: One step up to get in. The ladies' toilet is accessed via the lower seating area, which is down three steps; and there's one or two more steps to get to the actual cubicles. Not sure of the situation re the gents'. The beer garden is also down some steps. Last visited by Kake and Jo, June 2010. Opening hours and food times taken from the Fox & Hounds website, June 2010. Last edited 2015-09-12 13:59:58 (version 8; diff). List all versions. Page last edited 2015-09-12 13:59:58 (version 8).